The astonishing story of the efforts of scholars and activists to rescue Jewish cultural treasures after the Holocaust In March 1946 the American Military Government for Germany established the Offenbach Archival Depot near Frankfurt to store, identify, and restore the huge quantities of Nazi-looted books, archival material, and ritual objects that Army members had found hidden in German caches. These items bore testimony to the cultural genocide that accompanied the Nazis' systematic acts of mass murder. The depot built a short-lived lieu de memoire--a "mortuary of books," as the later renowned historian Lucy Dawidowicz called it--with over three million books of Jewish origin coming from nineteen different European countries awaiting restitution. 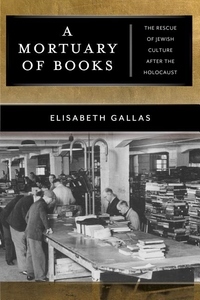 A Mortuary of Books tells the miraculous story of the many Jewish organizations and individuals who, after the war, sought to recover this looted cultural property and return the millions of treasured objects to their rightful owners. Some of the most outstanding Jewish intellectuals of the twentieth century, including Dawidowicz, Hannah Arendt, Salo W. Baron, and Gershom Scholem, were involved in this herculean effort. This led to the creation of Jewish Cultural Reconstruction Inc., an international body that acted as the Jewish trustee for heirless property in the American Zone and transferred hundreds of thousands of objects from the Depot to the new centers of Jewish life after the Holocaust. The commitment of these individuals to the restitution of cultural property revealed the importance of cultural objects as symbols of the enduring legacy of those who could not be saved. It also fostered Jewish culture and scholarly life in the postwar world.